Prep time: 25 minutes active; 55 minutes total. Peppery watercress adds zing—and a vitamin and mineral boost—to this aioli chicken wrap. In a small bowl, mix together the watercress, parsley, garlic, lemon juice, olive oil, salt and pepper. Use half of this mixture to marinate the chicken breasts for 30 minutes, in a covered container or a tightly-closed plastic bag, in the refrigerator. Mix the remaining sauce with the yogurt and mayonnaise to make the aioli sauce and set it aside. Preheat the grill to medium-high heat. Grill the chicken breasts for 8-10 minutes on each side, making sure the chicken is cooked to an internal temperature of 165 degrees F. Remove the chicken from the grill, let it rest for a few minutes, then slice it into bite-sized pieces. While the chicken is cooking, dice the tomato, red onion and avocado, and wash and dry the lettuce leaves. 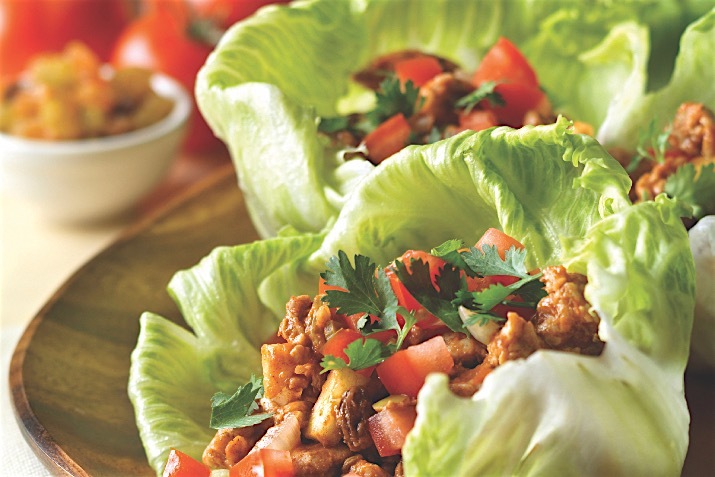 To serve, double up the lettuce leaves on individual plates and fill each lettuce cup with tomatoes, onions, avocado and cooked chicken. Drizzle with the watercress aioli sauce and serve with a lemon wedge. Add any extra filling ingredients you like, such as alfalfa sprouts, sliced olives, cooked black beans, corn kernels or shredded or crumbled cheese, then gently roll up the lettuce and enjoy the wrap burrito-style.